UDM Downloads > AVS Ringtone Maker! AVS Ringtone Maker - the best way to add individuality to your cell! Create custom ringtones from any input audio of the following formats: MP3, WAV, AMR and upload it to cell phones & mobile devices via Bluetooth, IrDA or USB. Take your favourite song or a soundtrack from your favourite movie. Select a small part you like or the whole file and send it to your cell phone. Make any sound a ringtone to surprise your friends and relatives. Record a wind howl, your friends sing or your kids laugh, your doorbell, or any sound you can think of and make it your ringtone. 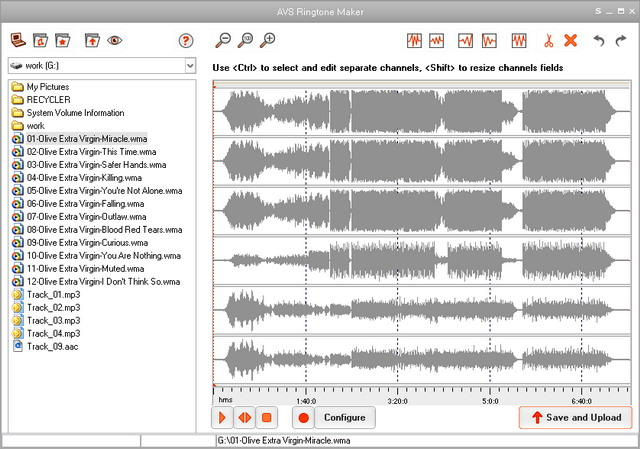 AVS Ringtone Maker is a part of AVS4YOU.com package. Register once at avs4you.com and work with all 22 tools from the AVS4YOU.com package. Subscribe for $29/year or $49/lifetime. AVS4YOU tools let you easily rip, convert and edit audio/video files, burn DVDs, create ringtones, upload videos to portable devices, players, phones and much more! As a registered user you can use every utility when you need it absolutely for free.